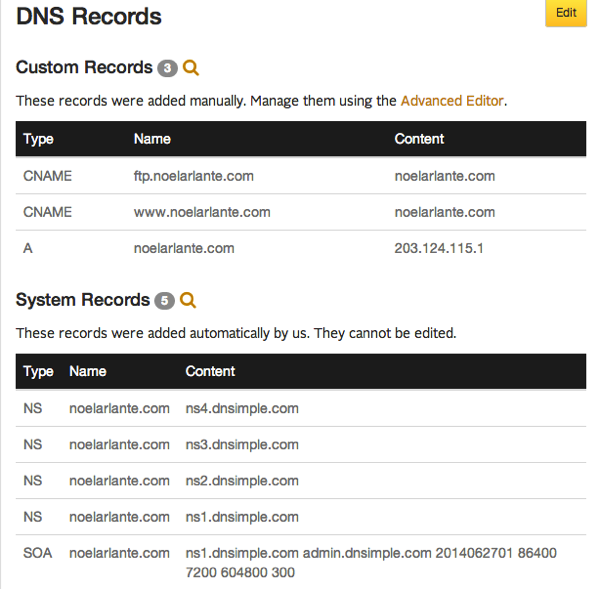 Changing My DNS Provider to DNSimple – What DNS Record? I made a blog post two years ago on how I setup this site File -> New Blog Project. As of this writing, this site is using WordPress and GoDaddy.com for web hosting and DNS. Lately, I have noticed that sometimes I cannot access my website noelarlante.com and its admin page. Its maybe my internet provider is slow? or my internet is totally down? A quick access to Google proves otherwise. I did a trace route to noelarlante.com and to my surprise I got timeouts (* * *) on after a certain ip address. My main hosting ip address is working which means the domain name resolution is not working due to the time out. Although I still have two more years with GoDaddy DNS, but I have decided to try and use DNSimple. DNSimple Support page provides a topic on How Transfer Domain Without a Downtime, which is the perfect information I need to prevent downtime for my website. Transferring a domain to DNSimple was painless. Its just that I missed a step that ended my site to be down for a day – more on that next. Here are the steps on how to transfer a domain to DNSimple without a downtime based from the Support page of DNSimple. I’ve highlighted the one step I’ve missed. After doing the *ALL* the steps I thought that I will just need to wait for the DNS to propagate to all servers and then thats it, transfer done. But after awhile I tried to hit noelarlante.com but I got a “Host Unreachable” error on my browser. Something is wrong and I soon figured that there is a disconnect from my DNS to my hosting server. According to Wiki – DNS records or resource records (RR) is the basic data element in the domain name system. CNAME – CNAME is short for Canonical Name. It is the record that maps an alias to an address. The “www” is considered an alias or an address going to noelarlante.com. 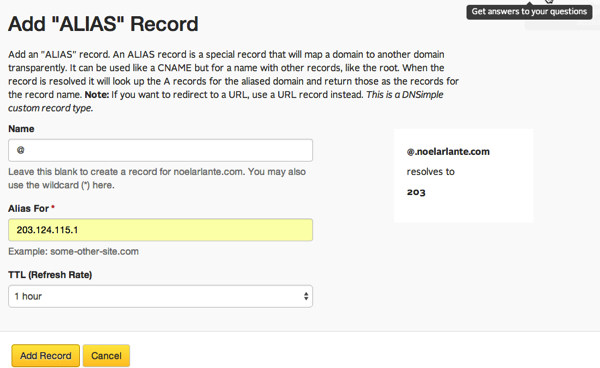 If no CNAME with “www” is added to the DNS record, www.noelarlante.com will not be resolved to noelarlante.com. I got my website a new DNS service provider and so far I’m happy with the response time when I visit my site. This is not in anyway a paid advertisement for DNSimple, I’m just sharing my experience and hope others can find this post and not forget that DNS record step.